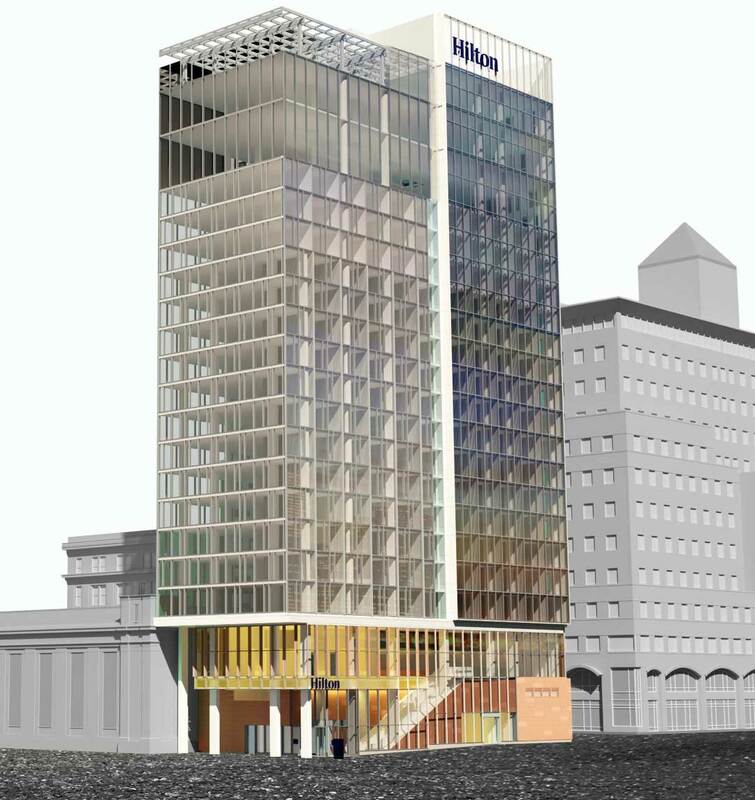 Updated Hilton hotel design in Hoboken revealed. Rendering via Cooper Carry Associates. 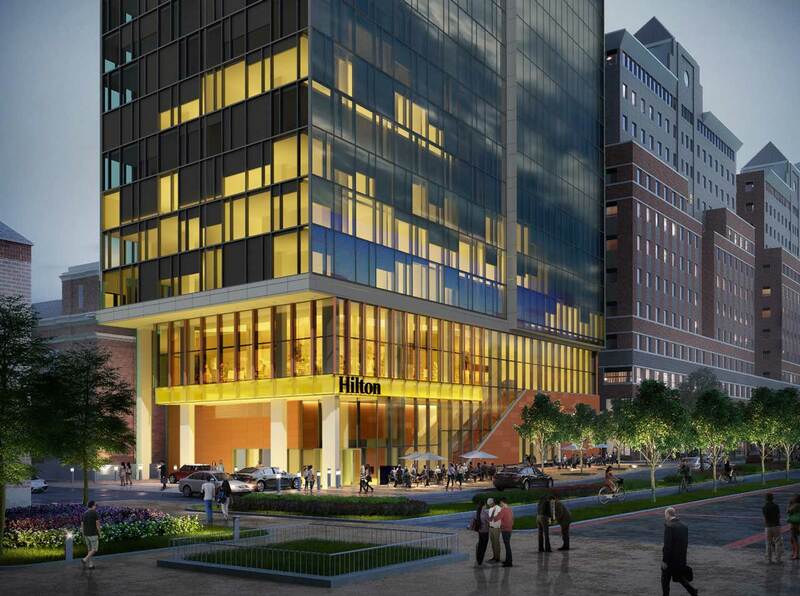 Despite some heated back and forth between public officials, the Mile Square City officially moved ahead on a plan for a Hilton hotel along its waterfront, and new details and updated renderings have been released as to what the development is set to look like. A lot of different versions of the project have been drawn up since KMS Development announced their desire to build a new hotel on a parking lot behind the Frank Sinatra Post Office. After over three hours of discussion, the final deal was approved by Hoboken’s city council this week in an 8-1 vote. There are a few notable changes in the hotel’s design; the building’s footprint will now total 12,647 square feet and include 20 stories, rising 270 feet at its tallest point. Hilton hotel, Hoboken. Rendering via Cooper Carry Associates. The eventual Hilton hotel, which has a 20% bulk height increase from the previous version, will be entered on Sinatra Drive through a 1,234-square-foot lobby that will cover the first and second floors. A restaurant and bar will be situated on the second floor overlooking 1st Street, while the 18th and 19th stories of the building will feature high ceilings and meeting space, plus a ballroom. The property’s top floor will consist of another bar and event space, including a 2,899-square-foot outdoor terrace section that will be open to the public at least 300 days per year under the agreement. The remaining floors will house the hotel’s 349 rooms, and a 959-square-foot ground-floor retail space will be flood-proofed and front Sinatra Drive. Other newly disclosed details of the hotel itself, which will strive for LEED Silver certification, include a subsurface detention system on the property that will be capable of storing 8,200 gallons of rainwater. As far as parking goes, KMS has reached a tentative deal to lease 88 valet spaces in the nearby Wiley building at 111 River Street for guests. As part of the deal to get the hotel built, KMS will renovate the existing Post Office and create a loading lock to be entered on 1st Street behind the existing building. 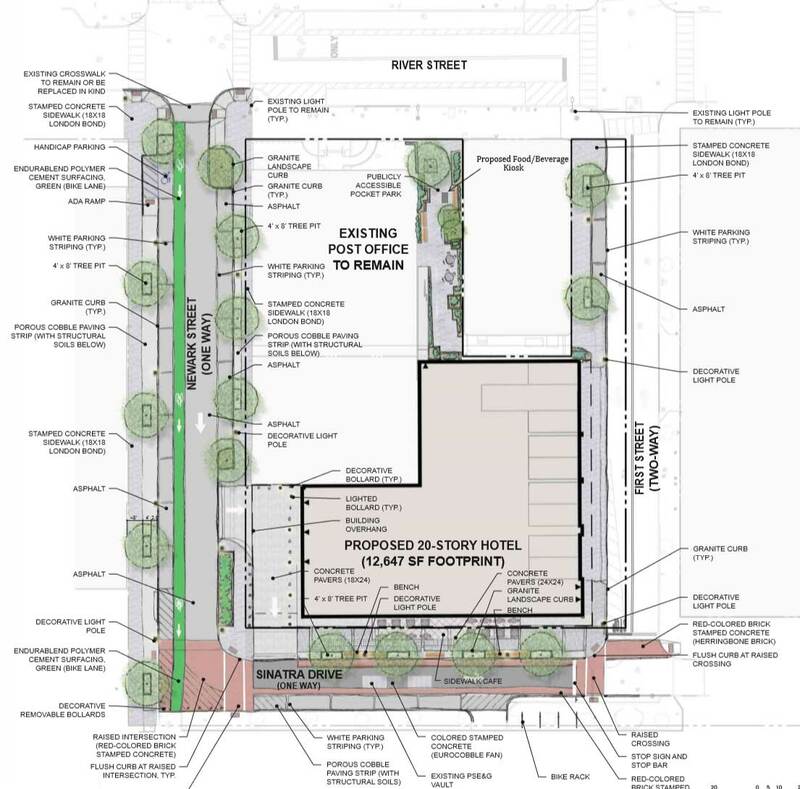 The project will also create a public pocket park on River Street between the Post Office and neighboring property, which will back up to the Hilton and include a possible kiosk food vendor on-site. View of Hilton hotel from 1st and Hudson Streets, Hoboken. Rendering via Cooper Carry Associates. In addition to the Post Office renovation, the Mayor and City Council Subcommittee announced a negotiated deal with KMS last week that now includes $4.85 million in community benefits. Under the agreement, the developer will donate $2 million to renovate the Hoboken Community Center at the former YMCA property at 1301 Washington Street, with up to $100,000 being made immediately available to fund their feasibility study. The Community Center is set to include a re-opened public pool, a branch of the Hoboken Public Library, and space to expand the city’s pre-K program. Other givebacks include $1 million to improve infrastructure along 1st Street, $165,000 for infrastructure in adjacent neighborhoods, $1 million to the Hoboken Public Education Foundation, $484,000 to the Hoboken Public Charter Schools, and $200,000 for Hoboken’s Affordable Housing Trust. Area plan. Image via Cooper Carry Associates. The council will now need to pass the resolution on 2nd reading during their next meeting on November 7. Assuming that occurs, 2019 could see ground break on Hudson County’s largest hotel project, which will be 100% constructed and operated with union labor. A missed opportunity for world class architecture on an unquestionably world class site fronting the Hudson River and Pier A, Hoboken’s crown jewel park. What will be built is another big bland corporate glass box. The traffic to the area adjacent the NJT/PATH station already horrendous will become become impassable for large portions of the day with this project. $5 million in community givebacks or pay-to-play shakedowns? The Feds can’t investigate soon enough. Every one of those rending was doctored to make it look less inappropriately monsterous.